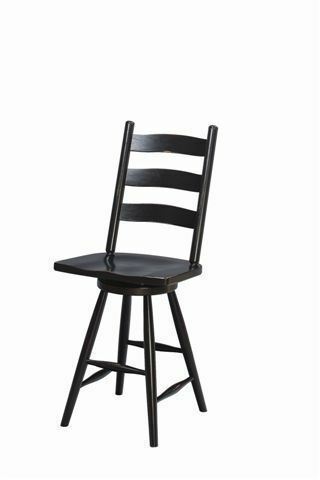 When you like more back support at the counter or bar, the Amish Galloway Shaker Swivel Barstools make great candidates for sitting comfortably. Solid wood stools with a popular ladderback design, this shaker style furniture is no frills and all function. Samples of wood and finish types are available by mail. You can also connect with an Amish Furniture Specialist by email (Questions@DutchCrafters.com) or by phone (Toll-Free 1-866-272-6773). One of the most rewarding things for our team is when your new custom furniture with the features you want in the wood and stain you prefer goes home to you. Check out our low flat-rate delivery options and 30% Down Payment Plan. Thank you for shopping with DutchCrafters.